'Great Lady' (William Simon, R. 1982). Seedling# 75-21-1. TB, 36" (91 cm), Late midseason bloom. 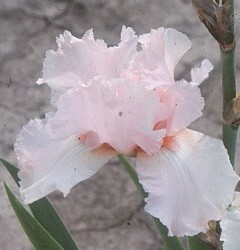 Ruffled and laced flesh pink; peach pink beard; pink style arms. 'Carved Cameo' X 'Grecian Gown'. Simon 1982.
jpg BHP_0199-X2_great_lady.jpg manage 180 K 19 Feb 2016 - 00:46 BrockHeilman Please contact Brock Heilman for image use.